Newly redesigned short cuffed sports riding motorcycle gloves. 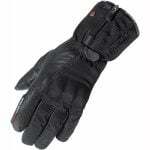 It's unusual to get a well-priced pair of motorcycle gloves that has the added protection of a Kevlar lining. That is what makes the Alpinestars SMX-2 Air Carbon gloves so special. They are light in weight but not light-weight, so they don't weigh you down but they are not flimsy. Mesh panelling make them very cool to wear in the summer and touchscreen compatible index fingers and thumbs make them great for today's modern rider.